Nothing beats the taste of food in Italy. I have only been once and I often think back to the tastes and flavors that I enjoyed during my time there. Many would assume that the next best thing to going to Italy is a great Italian restaurant. While I do love that (especially one that doesn’t mind us staying for a few hours) I personally get more excited to prepare an Italian meal at home. If I can bring in the freshest ingredients possible, try out an Italian recipe that maybe dates back a few generations and pair the meal with some solid wines it is almost a given that everyone will be extremely full and pleased. I used to work for vacations and make those few times in a year the big celebration time, but I realized that it’s so fun and easy to bring small celebrations into our lives on a much more frequent basis, and for me food is the vehicle that delivers this joy. Being able to eat fresh meals to our family is very important, and nothing is better than homemade foods that taste fresh. We make it fun, by grabbing organic foods from the local farmer’s markets and then cooking them as a family (we’re getting our kids involved in cooking early). Eating at home can be so fun, not to mention cheaper and healthier than most options elsewhere. Today I am going to show you how to make a homemade polenta gnocchi. This recipe is very simple and quick, too! 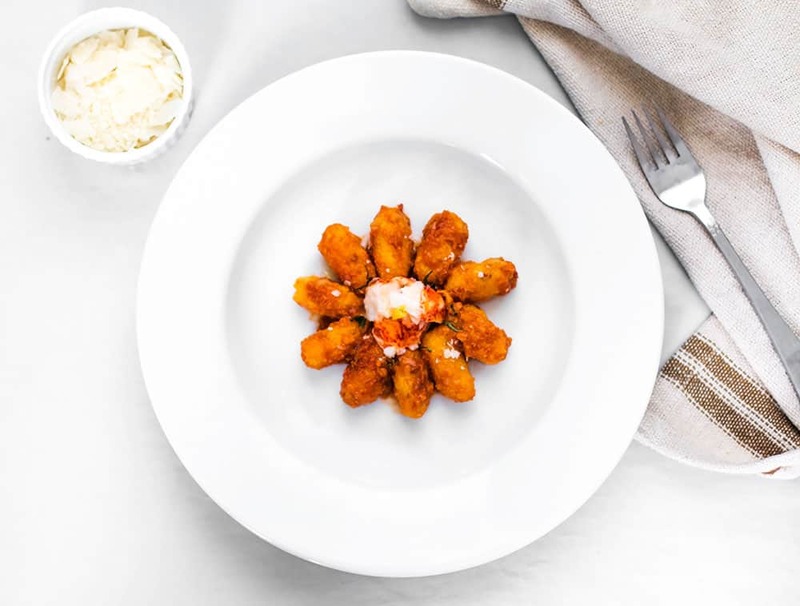 You can even freeze the gnocchi to enjoy a few days later. So easy, more time with the family and relaxing. Just grab a variety of pasta sauces and rotate the accompanying ingredients and it’s a whole new meal. 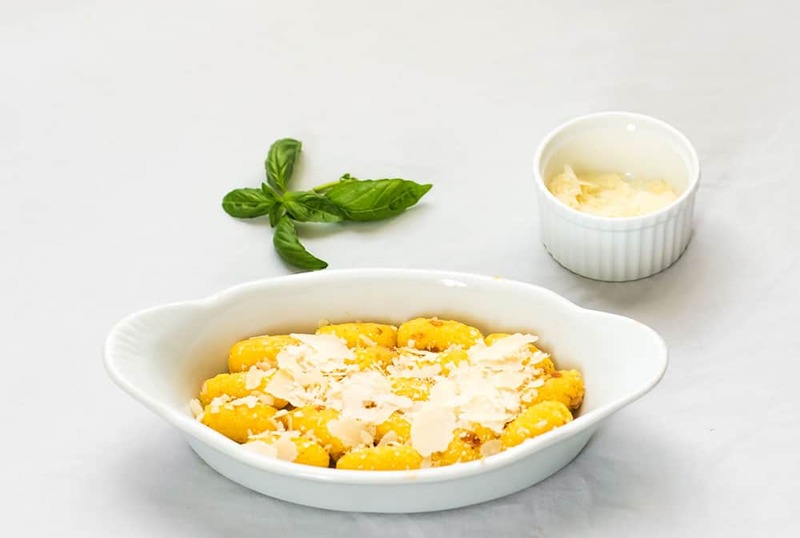 I pair these homemade polenta gnocchi with delicious Bertolli® Reserve sauces. Their Italian sauces are so rich with flavors and bring me right back to Italy. 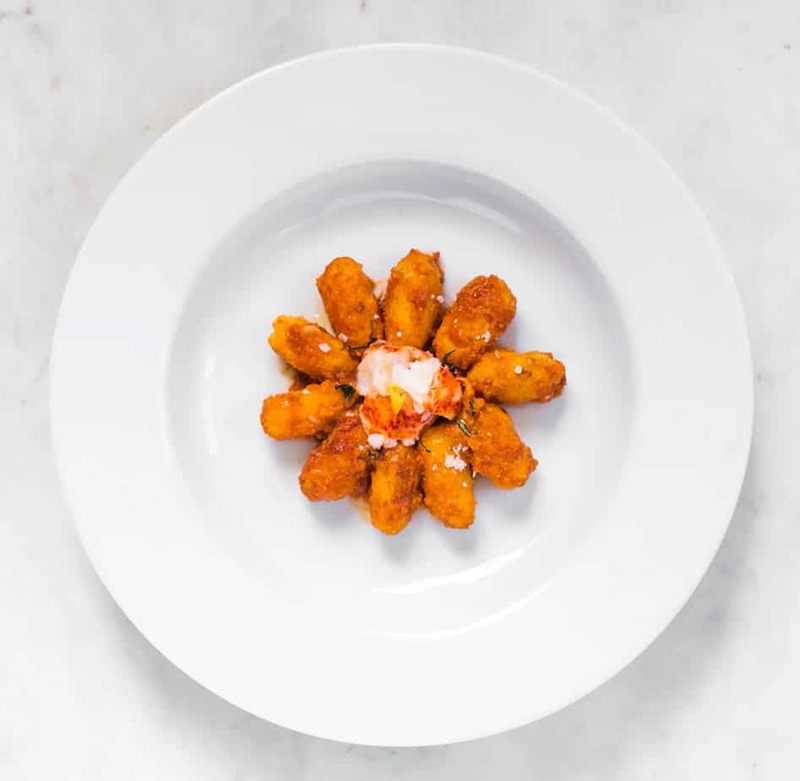 If you want to learn more authentic Italian tips which are cornerstones of many Italian traditions that we enjoy today, simply visit Bertolli® cooking school. If you haven’t heard of Bertolli®, I really think you’ll enjoy the story and especially the taste. Francesco Bertolli began selling his olive oil in the small town of Lucca, Italy 150 years ago in 1865, when he opened a store selling olive oil, wine, cheese and olives. As people migrated from Italy to America, immigrants wrote Bertolli® asking him to send crates of olive oil to America. He obliged and soon became the first exporter of olive oil. 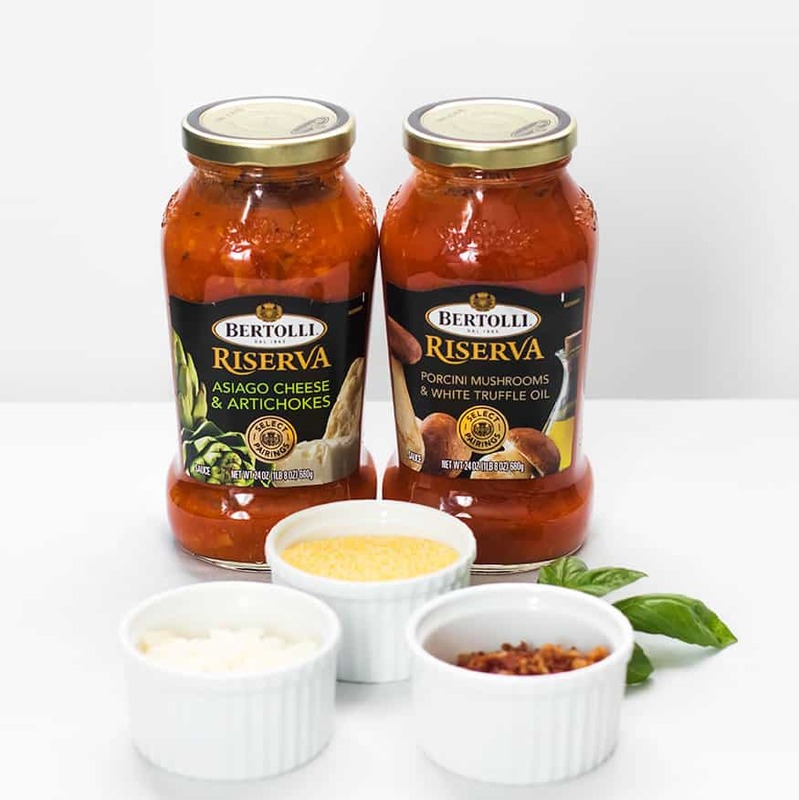 Today Bertolli has a broad range of Italian-inspired pasta sauce and skillet meals. Their “Villa Bertolli” in Lucca Italy still stands, and Bertolli is still today at the heart and soul of Italian cuisine across the globe. 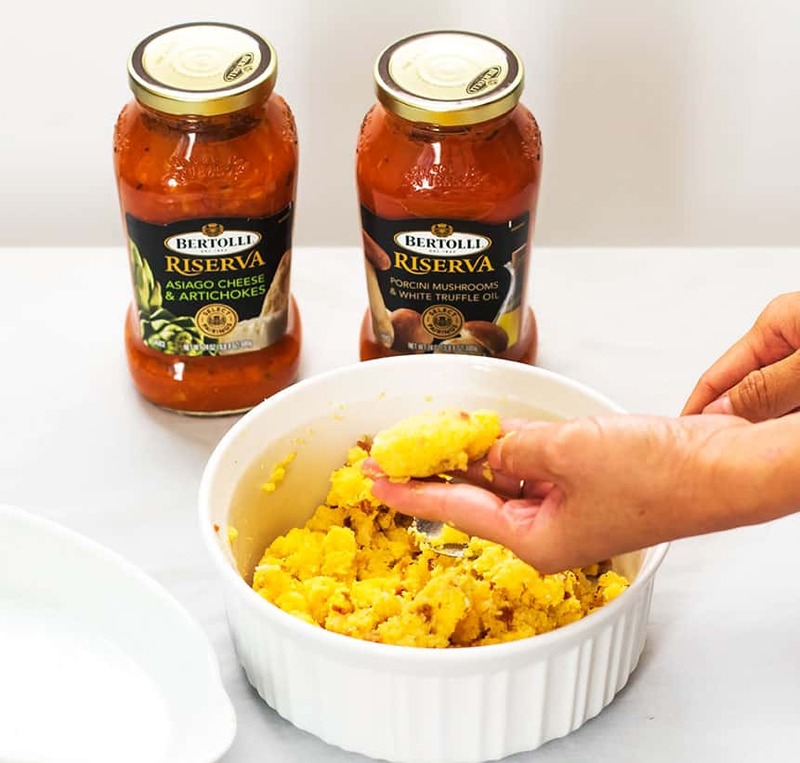 Don’t forget to pick up some Bertolli® Reserve sauces and be sure to print out the $1.50 coupon for Bertolli® Pasta Sauces. That looks so delicious! Making me hungry! That looks crazy good! My husband and I have a date night coming up. I think we should make this together. Gnocchi will always be a dish that I enjoy eating, but I don’t have enough confidence to make it! Lol. This would be an awesome opportunity to try. Oh this is an awesome recipe. 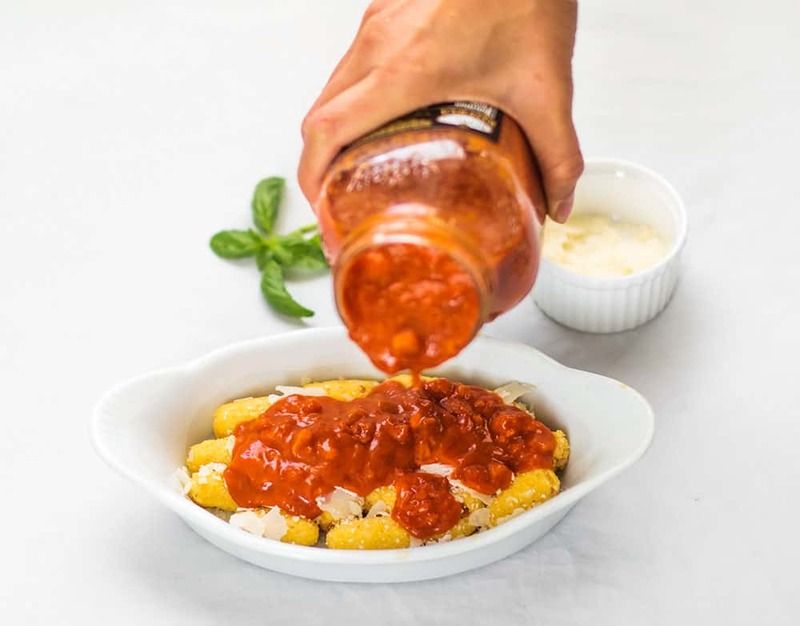 We’ve been really into gnocchi lately and this would be an amazing variation! I agree that looks CRAZY good and I don’t like seafood! That just looks so good. I need you to come teach me how to cook! I am a vegetarian but even to me it looks pretty spectacular! Do you take the photos of the food? This looks so good. I want some right now. Thanks. I enjoy your recipes too! I love Bertolli sauces but I haven’t seen this one before. This recipe also looks amazing!! YUM!! 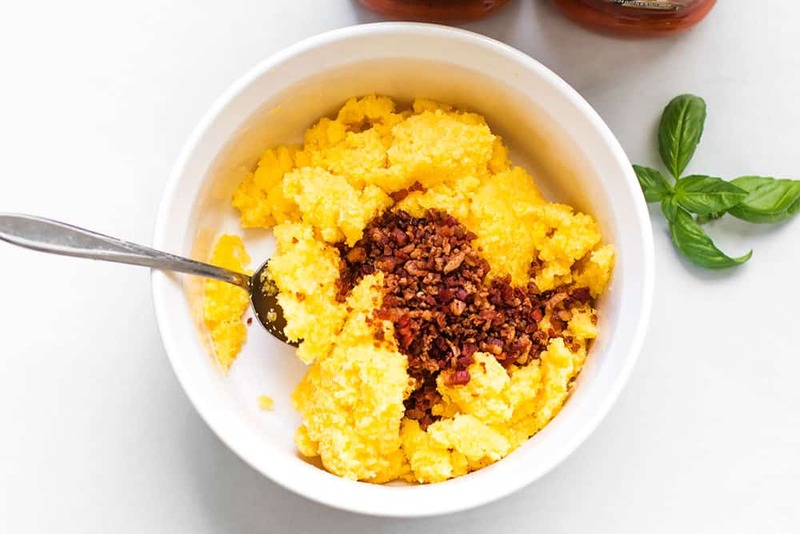 Your polenta bacon was really nice and looks presentable, I think it’s yummy and tasty, I wanna try it. This looks so good!! My husband loves lobster but I have never made it at home before, sounds soo good. My hubby loves gnocchi and serving it with steamed lobster would bring him to gastronomic delights. Thanks for the recipe. It just looks so delicious. I have never tried making a palenta dish. I would love to try the gnocchi, looks delicious. Looks scrumptious! We love gnocchi and seafood so this is perfect! Thanks for sharing! Oooh yummm!! Something me and my husband would definitely go crazy over with! I cannot wait to try this recipe! Now you have me craving lobster! 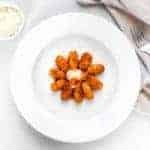 I have never made gnocchi and now I am dying to make this – thanks for the recipe! This recipe looks so good! I am a fan of trying new things, so I will have to make this! That looks yummy! I love the Bertolli sauces. It’s a great brand. I also love their pasta. This looks like a good way to get my husband to eat seafood. he has always been a fresh water fish kind of guy. I didn’t realize that they came out with a new pasta sauce. It looks so good and this recipe looks like a lot of fun! Gosh you had me at lobster! I would love to try a recipe like this. This recipe looks so delicious. i have never tried to make this before. I will have to get the ingredients so i can make some. Yum! Everything about this looks delightful 🙂 your plating is beautiful too! That’s a great soudning gnocchi. I’d like to make this for guests. That looks tasty! I’ve never had a polenta before. I hope I find it here because I want to try this. This looks absolutely delicious! Seems pretty easy to make too. We love Bertolli in our family. I would hold off on the bacon but everything else sounds extremely delicious. Anything with lobster is going in my mouth! This looks amazing, you have perfect presentation. My cooking skills aren’t that fancy. Bacon and I was good for this one. I’m impressed with this Riserva line from Bertolli. I really want to try out the Assiago Cheese & Artichoke flavor. Omg that lobster sounds so yummy!!! I so need to make maker some. Yum!! Now I am craving some gnocchi in a cream sauce. This looks so good. This is a perfect family dinner! My husband would love the incorporation of bacon and in my opinion you can’t ever go wrong with lobster tails.